Latin School of Chicago is a selective private elementary, middle, and high school located in the Gold Coast neighborhood on the Near North Side of Chicago, Illinois, United States. The school was founded in 1888 by Mabel Slade Vickery and is the oldest independent day school in Chicago. Latin School is a member of the Independent School League (ISL). 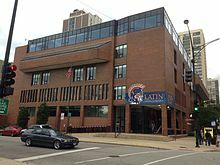 Latin School of Chicago is the oldest independent day school in the city of Chicago. Latin School was formed in 1888 by a group of parents seeking a better education for their children. Mabel Slade Vickery, a teacher from the East Coast, was invited to Chicago to open the school with a small class of ten 10-year-old boys. During the early years, classes were held in private homes on Chicago's near North Side. The parent-owned institution flourished and in 1899, with enrollment of more than 100 boys, the school moved into its own building and officially became Chicago Latin School. In 1913, a girls section was incorporated by Miss Vickery and became The Chicago Latin School for Girls. The schools merged in 1953 to form the co-educational Latin School of Chicago. The school was designed to provide students with a rigorous college-preparatory education in the classical tradition, with a curriculum that was heavily influenced by Classical studies and the study of the Greek and Latin languages, hence the name “Latin School." The Latin language is still taught in the middle and upper schools today. While it was started as a neighborhood school, Latin School currently is home to more than 1,100 students from approximately 70 ZIP codes throughout the Chicago area. The school awards more than $3 million in need-based financial aid each year. The current campus has three buildings. The lower school (junior kindergarten to grade 4) building is the oldest structure dating to 1926 and is located at 1531 N. Dearborn. The upper school (grades 9–12) building at 59 W. North was completed in 1969. The middle school (grades 5–8) building, located at 45 W. North, was completed in the fall of 2007. It includes a green roof garden and was designed with environmentally friendly materials. The building was awarded LEED Gold certification by the U.S. Green Building Council in 2012. The upper school building was designed by internationally acclaimed architect Harry Weese. The upper and middle school buildings are connected by two bridges, and both divisions use both buildings, with many middle school arts and PE classes held in the US and all HS science classes in the designated science center in the MS. The average class size is 14 students and the student-to-faculty ratio is 8:1. The school offers over 150 courses, several at honors level and about a dozen at AP level. Several electives are also offered. Latin has a visual arts department, notable for its many extracurricular/elective opportunities and its Global Studies: Visual Arts class. The school is also noted for its Mickey & The Masters project where, as a culmination of their study of the History of Western Painting, ninth grade students recreate master paintings with the added challenge of substituting Mickey Mouse as the main character. The school has two galleries with 14 events hosted annually in Gallery 2. Several electives and extracurriculars focus on performing arts, music, and public presentation. There are 19 yearly performing arts productions and concerts, including but not limited to faculty and student directed plays, semiannual band and chorus concerts, a student-faculty chorale, and semesterly dance performances, and the productions are well funded by the school.